Jesus Loves Santa, and So Should You! I was 7 years old. It was Christmas Eve, and we were driving home from our annual Christmas Eve dinner with my grandparents. As I sat in the car on the drive home, looking out the window, I saw him. I saw Santa Claus! He was flying through the sky, all lit up with his sled and flying reindeer. My brothers and sisters all clamored to see him and then we sat in amazement, talking about it for the rest of our drive home. We couldn't believe that we had seen Santa! Then when we got home, we set out cookies and milk for him (and carrots for his reindeer), and we went to bed. The next morning, we woke up to an almost-magical display of presents and colorful lights, and sitting beside the half-eaten cookies and empty cup of milk was a note from Santa. It was written in calligraphy on special stationary, and in it Santa told us that he had ripped his pants on the way down our chimney, so he was very thankful for the milk and cookies to refresh him. With a flash of excitement, I ran over to the chimney with my brother and sister and there it was: a piece of red felt. I was holding a piece of Santa's pants! Later, I found out that the Goodyear blimp flies around with a Santa display on the side of the blimp on Christmas Eve. And I noticed that the note from Santa was written in the same calligraphy that I'd seen my mom use on special cards. But that was just a coincidence. I'm pretty sure that I saw Santa that night, and he wrote me a note, and I have a piece of his pants. Now that I have children of my own, how to handle Santa Claus is something my wife and I have thought deeply about. We've considered the possible negative impacts of celebrating Christmas with Santa Claus. (No, I'm not talking about silly reasons like "SANTA" is an anagram of "SATAN"). There are real reasons for Christians to be cautious of Santa. For one, Santa could detract from the true meaning of Christmas. There's a real danger in replacing the story of God sending His precious Son to be born into a cold, dark world with a secularized narrative about the North Pole and elves and reindeer and the like. This is an easy way to keep Christmas fun but devoid of any significant meaning or truth. In our family, we want Christmas to be about Jesus--that He came to pay for our sins and rise from the dead, conquering sin and death forever. There's also a danger that Santa can feed into our culture's commercialization of Christmas so that my children become overly obsessed with gifts and getting. Instead, we want them to feel a sense of joy in giving; to know deep within that "it is more blessed to give than to receive" (Acts 20:35). And finally, Santa Claus could feed a works-based mentality--someone who checks a list and rewards good behavior while leaving coal for bad behavior is contrary to the grace of the Lord Jesus that we want our children to understand. But must Santa always carry this negative baggage so that he obscures the truth about Christmas? I don't think so. I believe that Santa can communicate profound truths to children. Some stories, such as fables, fairytales, and parables are not empirically true, but still communicate profound truths about reality, God, and the human condition. Other stories are empirically true and also communicate these kind of truths. The story of the Nativity is an example of the latter, while the story of the Prodigal Son is an example of the former. Both communicate profound truths, but only one is empirically true. Santa embodies Christian virtues such as kindness, generosity, joy, and grace (which every child eventually realizes when they haven't been good all year long and Santa still comes through!). Of course, this depends on which version of Santa we teach to our children. Santa has been hijacked and commercialized by advertisers. So we need to be careful about focusing exclusively on Santa, allowing a wishlist to become a demand-list, or using Santa to threaten or manipulate our children. But allowing children to embrace Santa while they are young can teach them profound truths about grace and a good giver of gifts. But what if all the excitement about Santa detracts from the excitement about Jesus? C.S. Lewis (who, by the way, included Father Christmas in one of his Narnia books) often corresponded with readers. One youngster, 9-year-old Laurence Krieg, confessed to his mother that he might love Aslan the Lion more than he loved Jesus, and felt guilty about this. His mother wrote to the publisher, and Lewis himself responded in less than two weeks. "Tell Laurence from me, with my love," Lewis wrote, "...[He] can't really love Aslan more than Jesus, even if he feels that's what he is doing. For the things he loves Aslan for doing or saying are simply the things Jesus really did and said. So that when Laurence thinks he is loving Aslan, he is really loving Jesus: and perhaps loving Him more than he ever did before ... I don't think he need be bothered at all." (The Collected Letters of C.S. Lewis, Volume 3, p. 1955). Lewis's answer is brilliant. God made our imaginations and hardwired us to connect deeply with stories. Jesus himself appealed to people's imagination by telling parables—stories that communicated profound truths. He knew that stories often capture the heart and imagination in a way that rational, hard facts do not. Would Jesus rebuke someone for feeling love towards the father in the Prodigal Son? Of course not--because the very things that stir our affections towards the father in the Prodigal Son are true of God in a far greater way! And likewise Santa can stir our affections towards God. 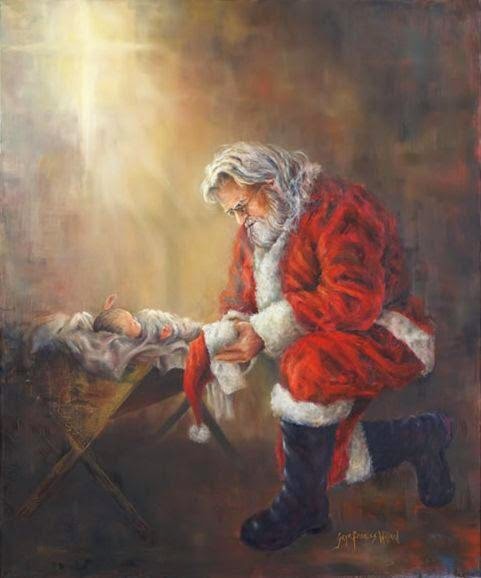 When we delight in Santa's benevolence and generosity, how much more so will we delight in the omnibeneovolent One who gave His own Son for us? Of course, our delight must not stop at Santa. But nonetheless, Santa can be a way we train our children to have their hearts and imaginations stirred towards goodness, and thus he can be a powerful way to communicate profound truths to children. But wouldn't this mean that we're lying to our children? Not necessarily. For one thing, Santa Claus was a real person--Saint Nicholas. In our house, we often talk with our children about the historical person of St. Nicholas, who loved Jesus and sought to honor Jesus and be like Jesus with a life filled with generosity. My children know that Santa loves Jesus first. When my children start asking questions about Santa, we pull out a book, and read some stories about the historical person of St. Nicholas. We don't strip the story of it's magic, but we also don't strip the story of it's history. We explain that St. Nicholas became Santa Claus. We don't go into detail about how this happened, but I suspect that when my children are old enough, they'll understand this and figure it out for themselves. This is a delicate balance, but for now, it's been a very positive one in our family. But secondly, I don't think that telling our children about Santa is an outright lie. My goal is not to deceive or manipulate my children, but rather to teach them truths by telling them a story. Santa is no more a lie than any other fairytale or parable that communicates a deeper truth. There's one final thing about celebrating Santa that I think is extremely positive: learning a sense of wonder. A sense of wonder is a tremendously positive thing, and my children are growing up in a world that seeks to strip this from them. They are growing up in a world that is increasingly secularized and portrayed as purely materialistic. Modernism has replaced the magic and awe people once experienced regularly with cold, propositional explanations. The existence an immaterial soul, of the spiritual world of angels and demons, and God Himself sometimes seems like an illusion. But as Christians, we know that a personal God exists, who is holy and pure and loves us deeply. He is real and substantial. He is not just wishful thinking or a psychological crutch. Although He is immaterial, He is the foundation of all reality. And He became incarnate--a human baby, our Creator, born to Joseph and Mary. And developing a sense of wonder can lead us to be people who marvel at our Creator's majesty, glory, love, and humility. Once I only thanked Santa Claus for a few dollars and crackers. Now, I thank him for stars and street faces, and wine and the great sea. Once I thought it delightful and astonishing to find a present so big that it only went halfway into the stocking. Now I am delighted and astonished every morning to find a present so big that it takes two stockings to hold it, and then leaves a great deal outside; it is the large and preposterous present of myself, as to the origin of which I can offer no suggestion except that Santa Claus gave it to me in a fit of peculiarly fantastic goodwill. Santa can communicate profound truths to children, and he can stir their affections and their wonder towards a reality that is only fully realized in our Creator. And so, in my family, Santa is celebrated. Sometimes he even tears his pants. Christmas: Celebrating the Christian History of Classic Symbols, Songs and Stories by Angie Mosteller - A near 500-page resource covering every aspect of the historical St. Nicholas and Christmas lore in general. The True Saint Nicholas: Why He Matters to Christmas by William J. Bennett - An easy read about the historical person of Saint Nicholas. Directed towards adults. My Christmas Collection: Three Favorite Stories by Harold Myra - Three great children's stories in one book. The middle one, "Santa, Are You For Real?" is especially good! (This story is also available as it's own separate book). Saint Nicholas: The Real Story of the Christmas Legend by Julie Stiegemeyer - A children's book telling the story of the real St. Nicholas. God Gave Us Christmas by Lisa Tawn Bergren - A children's story about a bear who asks, "Who 'vented Christmas? Was it Santa?" which leads to a discussion of God and Santa. Santa's Favorite Story by Hisako Aoki - A children's book in which Santa tells the story about Jesus' birth. (In this book, the shepherds find Jesus through a star, which is incorrect because actually, the Magi find Jesus through the star).